The Morkie is a small, intelligent and adaptable crossbreed of a Yorkshire Terrier and Maltese. This Maltese Yorkie Mix is a happy and loyal lap dog which is best suited to an individual or couple in a smaller home or apartment. Whilst playful and friendly, this little toy dog has a large appetite for attention and very quickly becomes emotionally dependent upon their owner. This adaptable dog loves to get along with other canines and pets and requires minimal exercise due to their small size. Despite their infamous tea cup size, and ability to easily fit into most bags, these dogs come full of life, confidence and attitude. Despite the fact that most could comfortably hitch a ride in a handbag, these little dogs can be brash and full of confidence. Read more to learn about their characteristics, hypoallergenic coat and temperament. Your crossbred puppy will weigh just a small four to six ounces once born! Because of their similar physical size, either breed can be the sire or dam. As both parents are tiny (typically less than 10lbs) their offspring will be too. First generation puppies are typically born into litters or three and four, however, sometimes litters have just two pups. Because of the smaller litter sizes and their toy/designer categorization; they can cost from between $1,500 to $3,000. Free Bonus: Download our free Checklist for a handy care guide on picking the perfect Maltese Mix. Whilst both parents are officially recognized by prestigious kennel clubs globally (e.g. AKC, UKC), their crossbreed offspring is not. This is due to the unreliable breeding of characteristics, appearance and temperament of first-generation mixes. With each successful breeding you are not sure what you will get! This spans from appearance (e.g. Black and Tan or White), size (e.g. 4lbs or 10lbs) and temperament. Your puppy may even inherit health issues; instead of removing the faults. Second generation Yorkie Maltese Mixes bred together can result in more predictable appearances. Their origin dates back to the late 1990s when their silky black and tan coats took the US by storm. This lapdog originated from the United States in the late 1990s. They have since established themselves as one of the most popular designer crossbreeds in the US. Likewise, the Maltese Ranks 33 out of 194 breeds. Despite only being in existence for 20 years, in 2008 this dog’s popularity peaked, thanks in part to Britney Spears buying Yorkies throughout 2007 and 2008. The Morkie was bred to become the ultimate designer lap dog being bred from two toy dogs. The goal was to create an affectionate, confident and low-shedding dog. Despite their small size, this dog packs a lot of personality, character and playfulness into their life. Like many terriers, this small lap dog has a feisty spirit with little understanding of their small fragile body. This dog is a bundle of energy with a friendly and loving personality. She will love to play and run around, especially indoors. Playing fetch and ball are some of their favorite games to play! She will have a strong temperament (i.e. confidence) which ensures she will get along perfectly well with other family pets (e.g. similar sized dogs and cats). Larger dogs should be avoided. Not because of hierarchy, but, due to the size difference. It’s possible for them to injure your little pooch during play. The Maltese Yorkie Mix will become attached to a single person; normally their master. This forms a strong bond very quickly. Whilst heartwarming to see such a strong bond, between canine and human, this can create problems. Underneath that playful independent personality is a true designer lap dog. This lap dog often wants nothing more than to be by their master’s side or sat on their lap. The fine line between affection and attention is a well-taken path by many Morkie owners. If the balance isn’t set appropriately by the master, you will have an overly dependent dog with behavior issues, anxiety and separation problems. Separation anxiety can pose large problems. 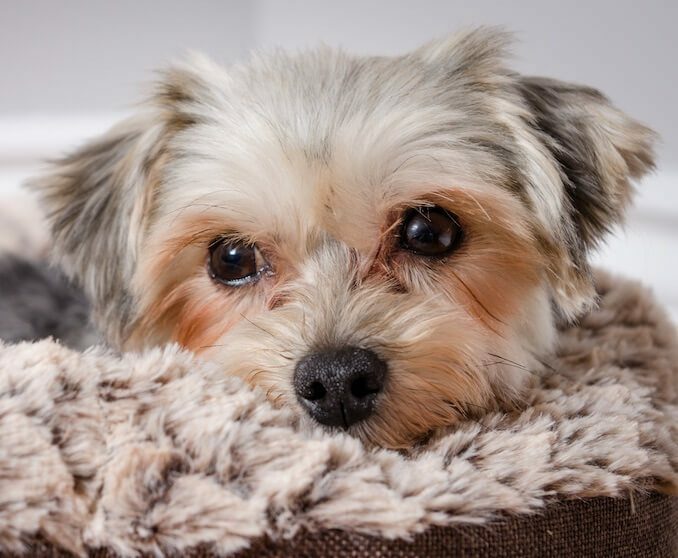 For this reason, this yorkshire terrier maltese cross breed are best suited to individuals or partners who have plenty of time and have previously owned dogs. Their love for baeking is always a cry for attention (remember we warned you above!). If not given enough attention, love and affection this dog will turn to barking and checking to create chaos and destruction. This tiny dog can have a huge appetite. They are more than able to consume their own weight in Kibble with little effort. That doesn’t mean you should allow them to though. Their huge appetite must be controlled by their owner. You should always make sure you follow the recommended serving suggestions for a dog, each feed will be slightly different. Smaller dogs typically require 40 calories per pound of body weight. Ideally, he should eat between 200 and 300 calories each day. This includes all of his snacks too! Start your puppy on four meals each day and over the first six months reduce this down to two meals daily. You can monitor his weight and progress using the chart below. Typical feed for this dog is a high-quality dry kibble. A dry-kibble also aids your dog’s dental hygiene. These dogs certainly don’t require huge amounts of physical exercise. They are not an ideal canine for running, exercise or hiking partners. A casual slow paced 20-minute stroll around the local park is more than sufficient exercise for their tiny paws and will have many benefits for your health too. Because of their tiny size, it’s best to walk them on a leash rather than risk injury. They are more of an active indoor pooch, than high energy outdoor dog. Whilst indoor they are happy to run and chase for 10 minutes at a time. This Yorkshire Terrier and Maltese cross should not be over-walked due to the common injuries associated with over-walking toy breeds. They are best thought of as an energetic rather than athletic! This breed can sometimes be difficult, if they aren’t getting the attention they require. Two words to perfectly describe training your little pooch. Like any dog breed, negative, high repetition or force-based training won’t have lasting results. Instead, it will create negative results and be counterproductive. Training should take place as soon as you get your Morkie puppy and should revolve around positive reinforcement and play. Because of their high attention requirements, make sure each member of the household trains your dog. You can use play, food and praise reward based positive training techniques with this cute little Yorkie Maltese crossbreed. Previous experience of small dog training can be helpful, but, first time dog owners can train this little pooch perfectly well providing they invest their attention, patience and time. Any training plan for a dog must consider the dog’s intelligence, ability, temperament and behavior. It can be very easy to treat your pup as a lapdog. Don’t. Nothing will delight her more than spending time sat on her owner’s lap. However, you must make a deliberate effort to socialize your pooch with different people, noises, places, smells and animals. Especially within the first 14 weeks. They are known for getting on very well with other family dogs and pets. Socializing during their formative months is important to prevent them from becoming overly attached to you. It will also help to build puppy skills resulting in a healthy, happy and confident pup. If you can’t socialize your puppy; use a Puppy Kindergarten class. Training and socializing a Morkie is especially important to control their barking and separation anxiety. This breeds parent; a Yorkie – was adopted by Victorian house wives for their superb long coats. Like their purebred parent (i.e. Maltese), this hybrid is considered a non-shedder. Their long thin hair will require brushing daily. This will prevent knots, matting and tangled hair. Brushing daily is an absolute must to keep this superb coat in top condition. Your dog will also require bathing monthly to keep their skin and coat healthy. Use dog shampoo and not human shampoo. Finally, a monthly trip to a dog groomer is required for your little pooch. Whilst grooming your lapdog, make sure to pay attention to hair around the eyes, feet and legs to remove dirt buildup. Keep their eyes clean and prevent debris buildup. Finally, brushing their teeth a couple of times each week will help to prevent tooth decay and gum (i.e. Periodontal) disease whilst maintaining good dental hygiene. Their mother’s are famous for dark black eyes and white fur whilst their father’s for their beautiful black and tan coat. 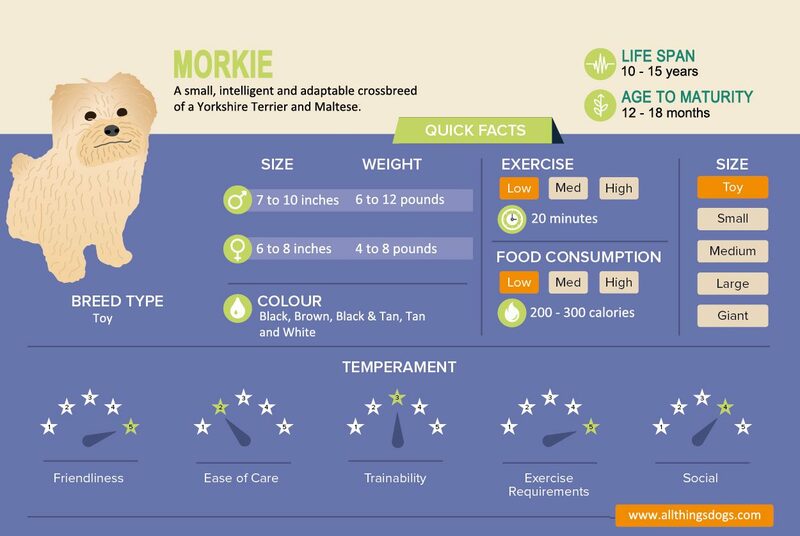 Unlike a purebred dog, especially one with pedigree, the appearance of a Morkie is not predictable. This is perpetuated because of inconsistent breeding standards and no formally recognized association to agree upon a breed standard. The appearance of each canine is heavily influenced by their parents. With both parents having a long, soft, single coat it’s not surprising your dog will have long hair too. However, he will typically have a long and soft single-coat made from hair not fur. Do Morkies Shed a Lot? They are a low-shedding dog, which coupled with their long-hair (not fur), makes them a hypoallergenic dog. This makes this breed a potential dog for humans which require allergy free dogs. You will not find dog hair on your bed or sofa! The coat will not be short, wavy or wiry, instead it will be soft, flowing and long. This beautiful coat requires a lot of hard work to maintain it – read the care guide above! The most common coloration is black and tan from a Yorkshire Terrier. As your dog ages most of the coloration becomes a silver gray. The appearance is therefore mostly a low shedding, long soft coat in black and tan. The variety in appearance is what makes this toy designer dog so appealing as each litter is very unique. Some puppies look more like a Maltese, however, mostly they have more of a resemblance to a Yorkshire Terrier. Miniature, or Toy Yorkies, are known as teacup Yorkshire Terriers. 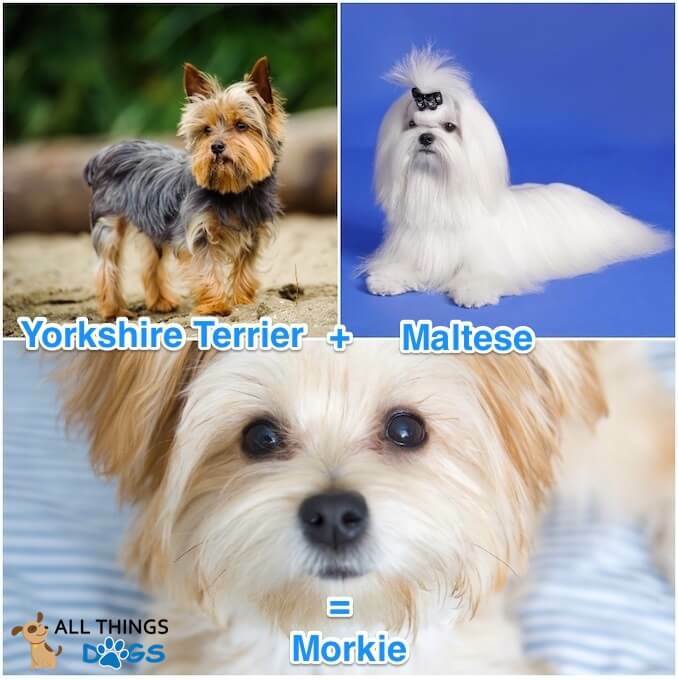 Morkies are bred from Yorkshire Terriers and Maltese purebreds, not miniature or teacup variations. However, it is true, at birth, this dog can fit inside a teacup as they can weigh a tiny 4 ounces. Like any dog, designer and toy breeds included, they don’t stay small forever. Like any considerate and loving dog owner, you are bound by conscience to understand the general health of your breed. They have the excellent genetics of their Yorkshire Terrier parent. This means their lifespan can be up to 15 years; there are reports of some living to 17! Their lifespan can be impacted by diet, exercise and mental health. Whilst there are known health conditions, due to the tiny size of this lap dog, a bigger concern is their fragility. 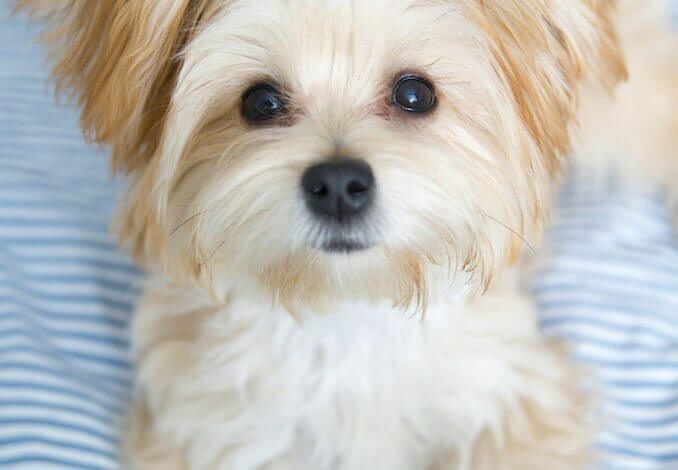 You must be careful and play very gently with your Morkie; another reason for recommending families to search for another dog as small children can often hurt fragile dogs without meaning to. 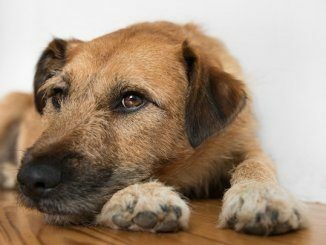 In general, this hybrid breed is a healthy dog, however, there are some health issues you should be aware of and some health issues which might pass down from their parents. Common health issues mainly relate to their eyes, ears or mouth (i.e. oral). The most frequent will be tear stains, dark brown or black marks, around your dog’s eyes inherited from their Maltese parent. Tracheal collapse, is a progressive disease of your dog’s trachea which typically occurs in smaller dogs and causes respiratory issues, frequent coughing and difficulty eating. Your dog may develop Cataracts. This starts as an imperfection in the lens and progresses into cloudiness causing vision impairments. Glaucoma affects over 40% of dogs and is a condition of the eyes. There is a buildup of pressure in the eye preventing fluids from draining which can cause damage to optic nerves of the eye. Reverse sneezing whilst not harmful can be distressing for your puppy as it causes gagging and forced rapid breathing. Whilst common in lots of small dogs, these health concerns are not certain to happen. Make sure they are reputable and are members of a safe breeding association. Physically inspect the parents for overbreeding and health issues by understanding a general health check. They are not a crossbreed of a Maltese and Biewer, but a Maltese and Yorkshire Terrier. First bred in the United States in the late 1990s and made popular by famous celebrities owning the Yorkshire Terrier parent purebred. As a puppy they weigh just four ounces; this is less than the weight of a glass of water. They have an exceptionally long lifespan, with some living past 15 years old; that’s over 76 years old in human years. They are a low-shedding hypoallergenic dog with long-hair. The Morkie is definitely a fun dog! An energetic, healthy and confident lapdog which is best suited to individuals or couples with smaller homes or apartments. Provide them with attention, some more attention and love and you won’t find a happier dog. They are not keen at all on being left alone and this will result in destructive behaviors. Whilst the temperament of each hybrid won’t be known until they have matured you will be sure to get a healthy and small lap dog from the Yorkshire Terrier and Maltese parents. 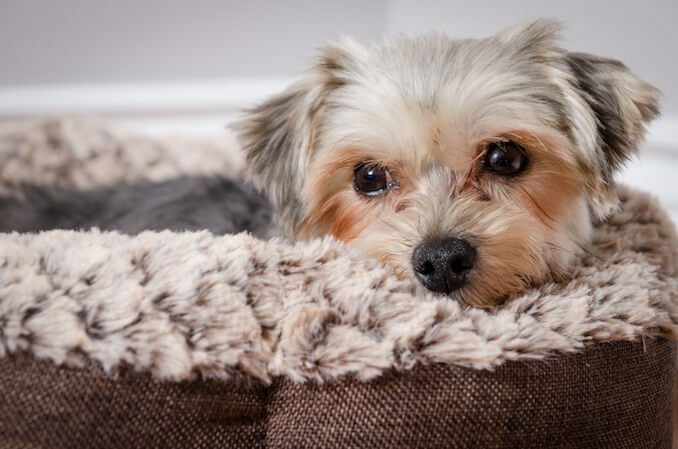 Let us know your experiences with a Morkie in the comments below. My Morkie is 7 years old, and I have to say he is the love of my life. He is the best dog that has ever owned me. He is the most intelligent and friendly little guy. Every where we take him people are drawn to him and he eats the attention as if it’s his last meal. Does Morkie outgrow the biting ? Mine is almost 4 months old and loves pull type toys,but he bites me in playing with his toys..and also eats his poop if I don’t catch it right away..thanks for your help. At four months old, your Morkie will certainly love to play. In terms of biting you during play, this is something I wouldn’t allow. A quick solution, is to withdraw play/attention whenever your Morkie’s teeth make contact with your skin. You can read more about this technique here. What’s the best treatment for colds, Snuffy nose. Hi Rick, you should make sure your dog is lots of rest and you can try a making a chicken soup (instead of kibble for a meal) – don’t use onions and other dangerous foods for dogs whilst making the soup. My female Morkie is approximately 8” tall at the withers and she weighs 7.2 pounds. She has such short legs and looks “wide” to me. I have tried several low cal foods and limited her intake, sometimes along with chicken in her food. Still, she gains weight or stays the same. I call her “stocky”. She can eat and eat but I limit it to about 1/2-3/4 cup per day. Any suggestions for feeding? Fellow Morkie owners – what would you recommend? 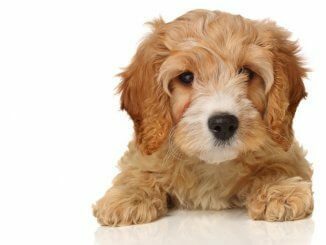 As discussed in the temperament section, we would recommend, if you have young children, then to search for a different breed as younger children can often rough-house small fragile dogs. I just had my first litter of 4 little morkies do you get their tails docked? And what about the ears ? I would speak with other Morkie breeders with experience. My advice is, for purely cosmetic tail docking, this is an unnecessary procedure and will impact the welfare of your dog – the same for their ears. A Morkie isn’t a working dog.